On Feb. 11, 25 people braved a sudden snow squall to speak out in defense of the Maryland DREAM Act outside a meeting of local Republicans hosted by Del. Pat McDonough. 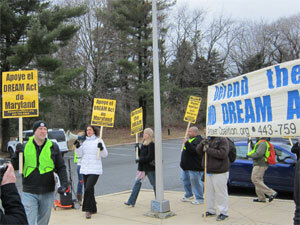 The Maryland DREAM Act is a piece of progressive legislation passed in Maryland in April 2011. It stipulates that undocumented immigrant students can pay public college and university tuition at in-state rates if they meet certain criteria. But Del. McDonough and other racist forces in Maryland immediately launched a petition drive that resulted in the DREAM Act being put on the Nov. 2012 ballot as a referendum. Unless the referendum is defeated, the DREAM Act will never be enacted. ANSWER’s campaign to defend the DREAM Act is a grassroots effort to confront the bigoted forces against the Act while mobilizing voters against the racist referendum. Winds from the sudden snowstorm broke the poles holding the rally’s “Defend the MD DREAM Act” banner, but they did not break participants’ spirits. Instead, chants only got louder, especially as passing cars slowed to see the action. ANSWER’s campaign to defend the DREAM Act will continue up through Election Day, and we call on all progressive people in Maryland, and all people committed to justice for immigrants, to join us in the streets as we spread the word and combat the racist, right-wing forces that seek to keep immigrants oppressed. Del. McDonough and his allies hope that they can take advantage of the undocumented being unable to vote in their own defense. Their intent is to demonize immigrants and spread racist lies among people who don’t understand the DREAM Act and the equal opportunity it represents. This is why ANSWER’s campaign to spread awareness and show support is important—even some attendees of the McDonough event seemed interested in the rally, and one woman and man brought the ralliers hot chocolate and expressed that they knew very little on the issue, but were glad to learn. Contact dreamact@answercoalition.org or call 443-759-9968 for information on upcoming events and to get involved!